Let’s see if we can justify the cost of the Ryobi RM480E battery operated riding mower. Many of us now want to dump the gas-powered riding mower for something quieter, easier to maintain and more environmentally friendly. But even so we’d like to feel good about that purchase. 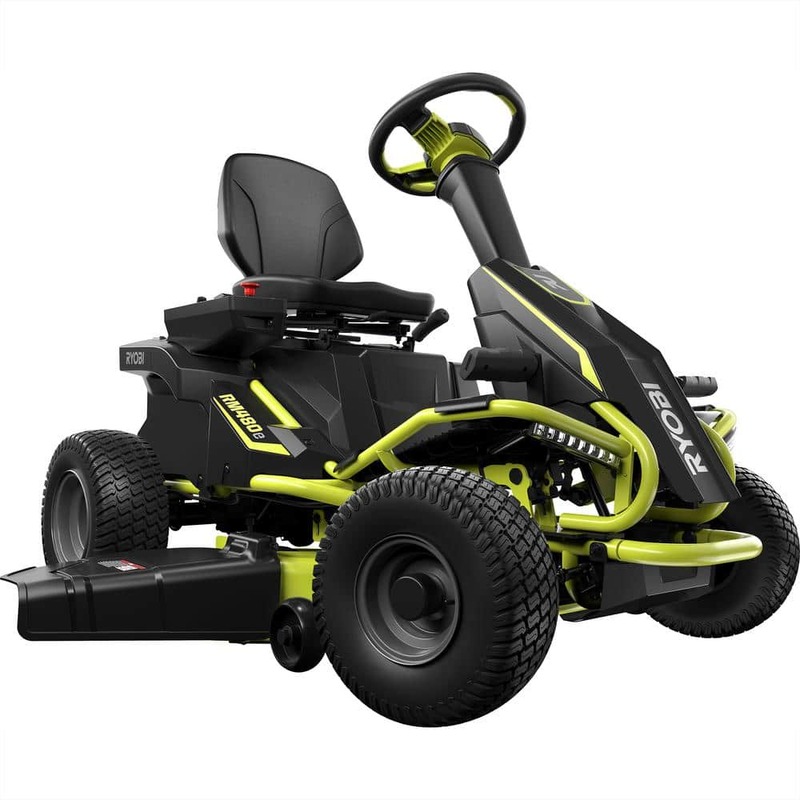 So let’s detail the purchase a new gas riding lawn mower, the Ryobi RM480E electric riding mower and then figure the cost of using each one for 5 years. The Ryobi RM480E costs more initially but it actually includes 3-5 years of normal operating costs in that price. In other words, when you buy a lawn tractor you pay an amount for the tractor and then over its lifetime you have to pay for gas, oil, filters, tune-ups, belts, mower blades, etc. With the Ryobi RM480E you pay for everything except the mower blades up front for at least 3-5 years. Mowers I used for this comparison. There is only one electric rider but well over 100 lawn tractors that fit into this general category. 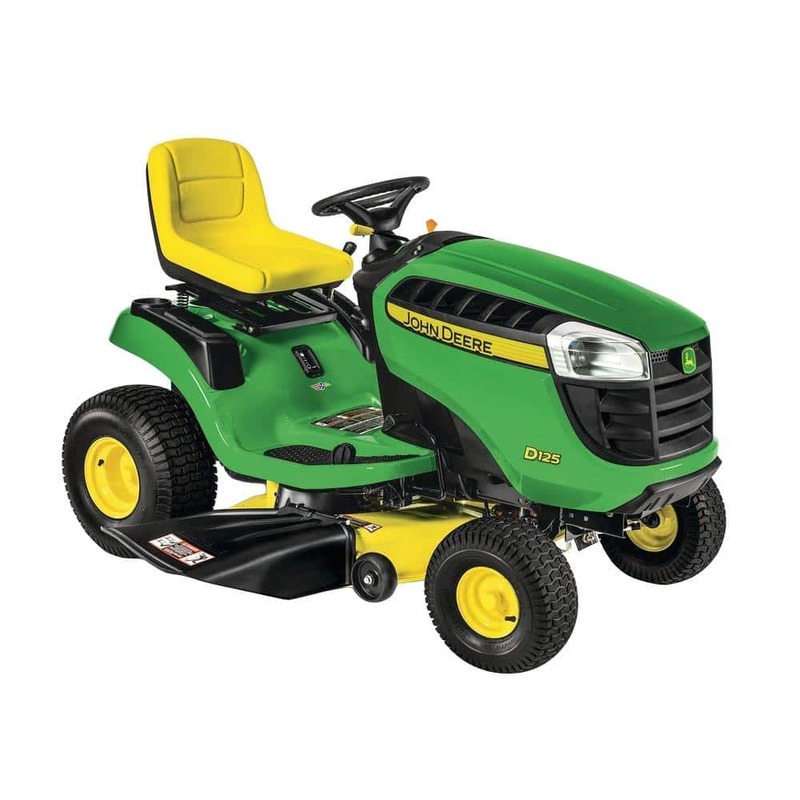 Some are much more expensive and there are cheaper gas-powered lawn tractors available but these are the most popular models sold on my site last year. I’m going to list the final numbers first and then if you are interested you may review the detail of how I came up with the numbers. Disclaimer: These are my own calculations based on average costs I am aware of from my own experience. Your cost or manufacturer’s published cost may be different. What is the actual cost of ownership per year for a typical 42-46 inch lawn tractor. $229 per year – Average Case. Performing your own maintenance. $309 per year – Worst Case Performing your own maintenance including replacing belts as part of normal maintenance. What is the actual cost of ownership per year for the Ryobi RM480E? $115 per year – Best Case. Performing your own maintenance, maintaining your batteries correctly, replacing batteries yourself every 7 years. $152 per year – Average Case. Performing your own maintenance including replacing batteries every 5 years. $237 per year – Worst Case Performing your own maintenance including replacing batteries every 3 years. If you have a repair shop do all the preventative maintenance the costs are about the same. If you do the maintenance yourself the Ryobi RM480E is the clear winner even if you don’t maintain the batteries and they only last 3 years. How I Made Up Those Numbers. I’m going to list the assumptions I made about your yard up front. You may adjust these numbers for your own particular lawn. Typical Lawn. The “typical” suburban lawn is 1/3 to 2 acres. We usually spend 40 hours per year mowing and running around it with our lawn tractor. Yearly Tune-up. Let’s be realistic. Most of us don’t tune up our own car. We take it somewhere. I expect that most of us don’t have the tools, time or patience to tune up and/or repair our own riding lawn mowers either now days. We either have a dealer service it or it doesn’t get done. Yes, the are a few tightwads, myself included, who will do all the work ourselves but…..
Yearly costs for Gas Powered Lawn Tractor. Fuel $100, Tune-Up $248 minimum costs $348 a year. When you figure typical belt life add another $100 or so per year. Ryobi RM480E Costs Per Year. Average price of electricity = 12 cents per kilowatt. Average amount of electricity to charge the 75AH batteries = 1.8 kilowatts. About 20 cents per charge. Using the 40 hours a year typical use above “fuel” cost is .20 times 40 or $8.00 a year. Battery Life. The big question is how long should these batteries last? Unfortunately, it is one of the hardest to answer. The correct answer for a typical golf cart battery is: “It all depends on how you take care of them.” Why is this? Well, deep cycle battery packs require some basic maintenance which includes maintaining the correct electrolyte (water) levels while ensuring the battery pack is fully charged and never left in a discharged state (plugging it in after each use). Deep cycle lead acid batteries get the longest life by having them constantly peaked (on the supplied charger) when not in use. Typically, a set of golf cart batteries that are used 1-2 times a week will last 5-10 years. Keep in mind the golf cart batteries are a lot heavier and a lot more expensive than the batteries in the Ryobi RM480E. The correct answer for the Ryobi RM40E is a little different. The batteries used are lead acid deep cycle but they are sealed batteries that are commonly used in powered wheelchairs. Physically they are smaller and require less maintenance for them to last. Since they are sealed you can’t and should not try to check the electrolyte level. They have an extra-large reservoir that has enough electrolyte to last the life of the battery. Because they are sealed expect to get 3-7 years in a wheelchair when properly maintained. In the case of the Ryobi RM480E then let’s guess that you will mow once a week and run around the yard for cleanup and gardening a few times a week. You keep the batteries properly maintained – that means leaving the charger plugged in all the time when you are not using the RM480E. All things considered, I am going to guess you will get at least 3 years and normally 5 years out of the battery set. If you never let the batteries discharge under 80% and keep them away from extreme heat or cold they may give you 7 years. Cost of Batteries. Home Depot will have replacement batteries available for this mower but they have not listed the cost yet. So, I’ll use Amazon prices for the exact replacement 75 AH batteries. 75Ah (LPC12-75) is $114 plus shipping. $159. You need four. $636. So cost at 3 years is $212 per year, cost at 5 years is $127 per year and cost at 7 years is $115. I don’t have any details on using a Ryobi authorized service center yet for the Ryobi RM480E. So I’ll use the same service/repair costs as the gas-powered lawn tractor. One set of mower blades $25. Using the same criteria as the gas-powered mower having a dealer pick up the Ryobi RM480E and changing the blade. Trip charge plus one hour labor. $169. Total cost per year $174. So what is the actual cost of ownership per year for the Ryobi RM480E? The typical cost of the lawn tractor is $1899 – the typical cost of the RYOBI RM480E is $2499. The difference is $600. The cost of the lawn tractor does not include the maintenance costs. Fuel and repairs are paid for when they are needed. The cost of the Ryobi RM480E includes the battery cost for the first 3-5 years. “Fuel” is included but not the mower blades. In summary, owning a typical 42-inch lawn tractor costs about $350 to $475 per year if your dealer does all the maintenance. Owning the RM480E costs $348 to $465 a year depending on how you maintain your batteries. If you do your own maintenance the gas-powered lawn tractor costs $249 a year and the RM480E Costs $237 for 3-year replacement and $152 if batteries last 5 years. I would feel quite comfortable buying the Ryobi RM480E for my one-acre yard.